I’ve gotten a number of emails about how to change different settings in Windows 7 or Windows Vista. Some of my customers tried to do some system modiffications by installing 3rd party software. Some of them reported system to be unstable. The problem is some of that software gives you an options you actualy shouldn’t change unless you know exactly what are you doing. Below I will show you a way to get an access to most of hiden system settings without using and installing any of so called magic tuneup, tweaking programs. 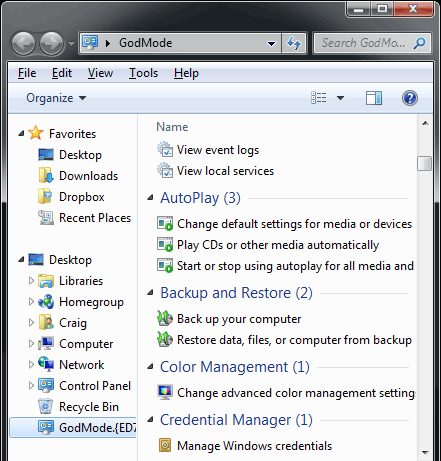 The feature I am talking about is “Windows God Mode”. What it basically is, is an extended control panel that allows you to have control over various aspects of the OS that are not typically surfaced via a GUI (Graphic User Interface). Nothing major, frankly, but interesting. Use at your own risk, of course.